The 800m is a tough race. It is kind of in the sweet spot of being a sprint and being a distance event. In other words, it requires a combination of speed and stamina. This past week, we saw some outstanding times come out of the El Paso areas. With four 1:55 times this week alone cranked up the West Texas stats to go along with the previous top times turned out earlier in the season from the Amarillo area. That brought the area's Median time to 1:58.19 and average time to 1:58.44, but that wasn't enough to take one of the top three spots in the state. The Houston Metro (Median - 1:55.83 and Avg - 1:56.86), DFW Metro (Median - 1:56.08 and Avg - 1:57.16), and Austin Metro (Median - 1:56.57 and Avg - 1:59.65) have turned out the top ranked performances by metro area this season. 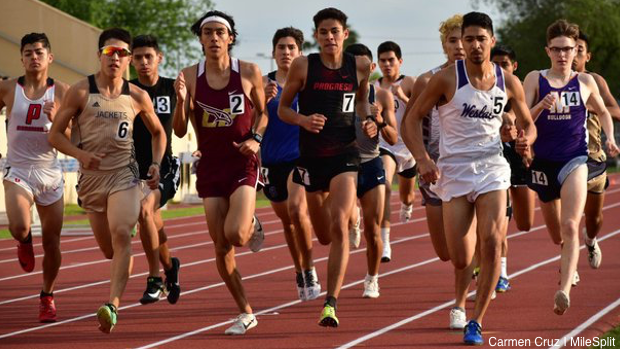 Check out the metro rankings for 2019 in the boys 800m as displayed in the tables below.